The origin of the early 1800s hostilities between the Yellowknife Dene and the Dogrib Dene – a “war” that is still remembered today – may have erupted, at least according to Samuel Hearne, as early as the 1770s and may have started as a fight over trade goods. The hostilities continued, as recorded in Hudson’s Bay Company trading post journals, into the 1800s. These journals most frequently mention Yellowknifes fighting and killing Dogrib. Again, according to records kept by the Hudson’s Bay Company, the Dogrib are said to have retaliated in October of 1823 when they killed 34 Yellowknifes, possibly one-fifth of the entire Yellowknife population. Close on the heels of this retaliation came peace. John Franklin, in the published account of his 1825 to 1827 journey to the Arctic Ocean, stated that “peace had been effected through the mediation of Messrs. Dease and M’Vicar [Hudson’s Bay Company] and we were gratified to find that Akaitcho and his tribe had been principally induced to make this reconciliation, by a desire that no impediment might be placed in the way of our present expedition”. Dogrib oral history tells a different version of this story. 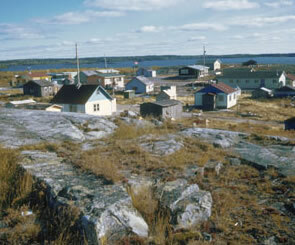 According to the Dogrib it was through the oratory skills of their Chief Edzo, during a large gathering held at Mesa Lake, that Yellowknife Chief Akaitcho was convinced he and his people should accept peace. The Yellowknife and Dogrib sealed this agreement with a huge celebration. It included a dance that lasted two days and it’s said that the circle from that dance can still be seen today on the shores of Mesa Lake.